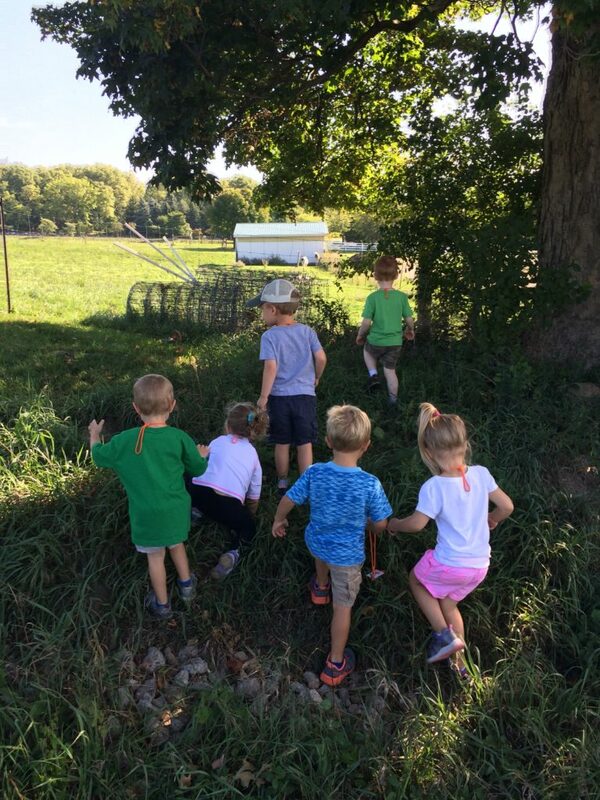 It was another gorgeous Tuesday in September on the farm! 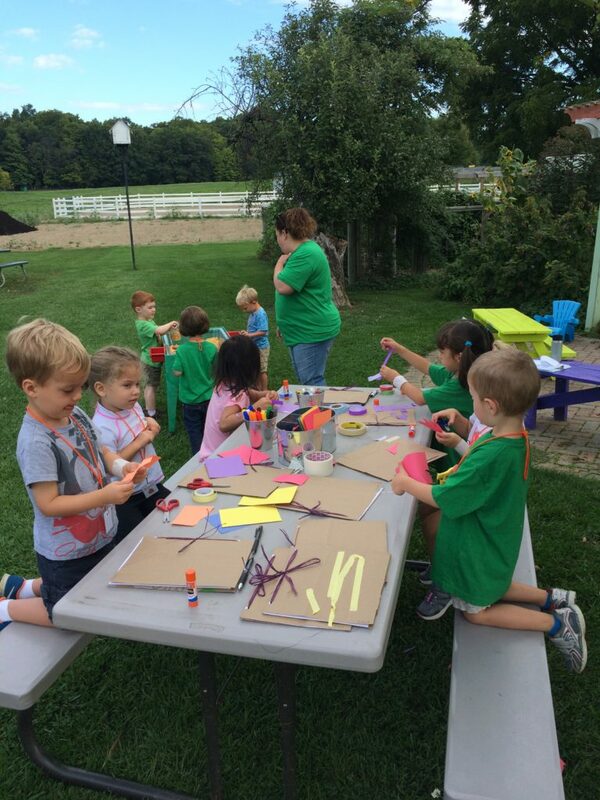 This first week of fall, Farm Sprouts signed in by forming wax sticks into letter shapes and voting for apples or pears. More children opted for apples, therefore guiding us to begin exploring (and tasting!) apples next week. 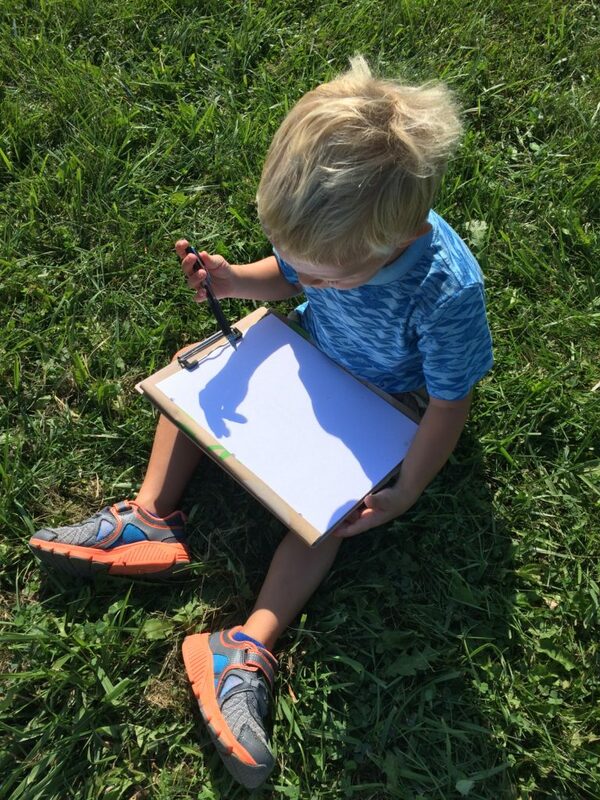 Other arrival activities included making tracks in play dough and observing a tobacco hornworm. We noticed his colors and identified the red “horn” which gave him his name. They were interested in hunting for worms in his soil, which inspired us to take out the vermicomposting bin. Everyone was happy to help out our red wigglers by adding moisture to their habitat. During our morning gathering, we again sang “Buenos días” by José Luis Orozco and practiced introductions with puppets, a duck (“el pato”) and a pig (“el cerdo”). We also played instruments and danced to “Barnyard Dance” by Adam Bryant and Michael Ford before feeding and interacting with our turtle, Coltrane. 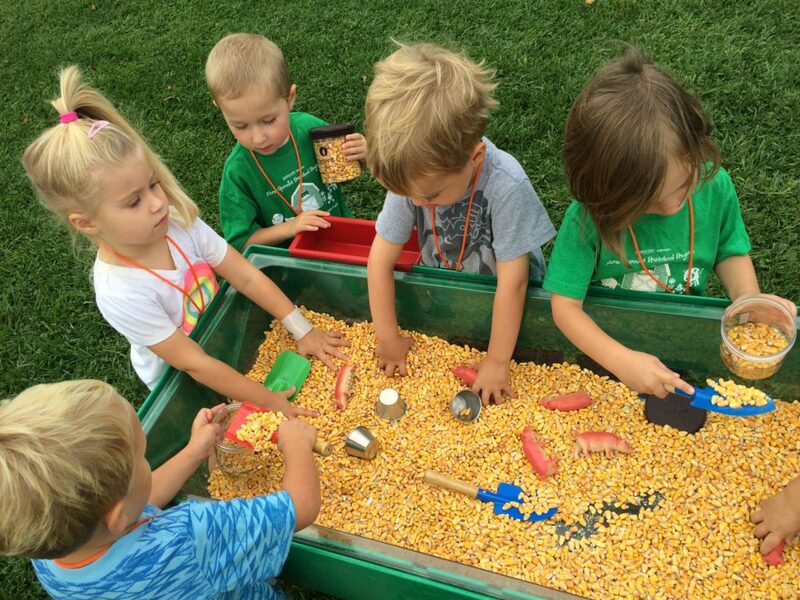 In our outdoor classroom, we personalized our nature journals and had fun with pigs, corn, scoops, and containers in the sensory bin. We stopped by the pond to feed the ducks, each of us having a chance to add some food to the dish. We noted their orange, webbed feet and bright, white feathers. We crunched on carrot sticks for snack, the same color of orange as the ducks’ feet! While we snacked, we shared our favorite fall activities. The group unanimously decided the best fall activity is raking leaf piles and jumping in the leaves. Families will have some very enthusiastic yard helpers this season! After replenishing our energy, we headed out on a big hike to the C.S.A. Garden to see the pigs. On our way, we spotted calves and horses. 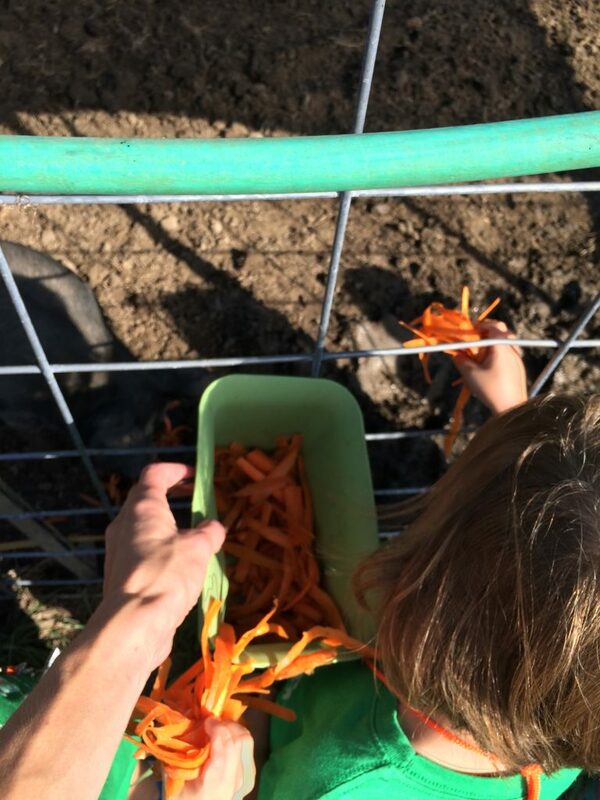 We fed the pigs our carrot scraps and noticed their body coverings, which included hair, skin, and a nice layer of mud. View a link to a video of us giggling at the pigs! 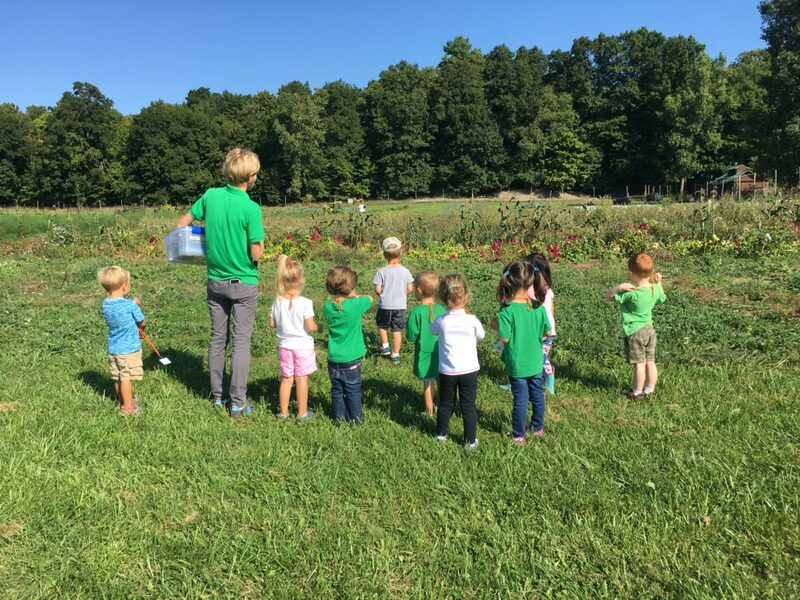 Next we admired the garden and the beautiful celosa flowers before setting out to document a discovery in our nature journals. We concluded by listening to a story about friendship called Ribbit!, by Rodrigo Folgueira and by giving thanks for our wonderful day.